Writer/director Stacy Cochran’s Write When You Get Work is a romantic comedy/drama/crime caper hybrid that works best when it concentrates on the love story. Finn Wittrock (American Horror Story) and Rachel Keller (Legion) lead the cast, and it’s their onscreen chemistry that drives the film. When the story veers off from their relationship, it stumbles and stalls. Write When You Get Work, which my brain insists on typing as Write When You Find Work, opens with a quick scene setting up the relationship between Jonny Collins (Wittrock) and Ruth Duffy (Keller). They’re young and in love, but their relationship’s tested when they discover Ruth’s pregnant. Not all the details are revealed as to what happens between the love birds. However, when the story catapults nine years forward, Jonny and Ruth are no longer a couple and the baby isn’t being raised by either parent. Ruth attempts to leave her life of petty crimes (she had a few run-ins as a teen) behind and has secured a decent job working as the admissions director at an exclusive school for girls. Jonny’s not faring as well employment-wise, and a friend hooks him up with a job as a coat check clerk at a club. That job leads to petty thefts from the customers to pad his income/impress his girlfriend. A chance reunion spurred by a mutual friend’s funeral brings Jonny and Ruth back into the same orbit. Jonny’s current girlfriend’s quickly discarded without as much as a wave goodbye as he obsessively pursues his exe. He even goes as far as to break into her apartment numerous times, although this creepy intrusion doesn’t seem necessarily unwelcome on Ruth’s part. Jonny goes through a series of elaborate ruses to keep in contact with Ruth at the prestigious school, while Ruth alternates between annoyance and approval of his efforts to reconnect. Jonny also connects with Nan Noble (Emily Mortimer), one of the wretched wealthy parents of one of Ruth’s students. Always working an angle, Jonny cooks up a bizarre plan to steal millions out from under Nan’s haughty nose. The cast’s terrific but the story sags when it heads off on a weird tangent involving hiding Nan’s fortune while her hedge fund manager husband’s under indictment. The puzzle pieces don’t fit and the story comes to a jarring halt while the bizarre bait and switch is going down. 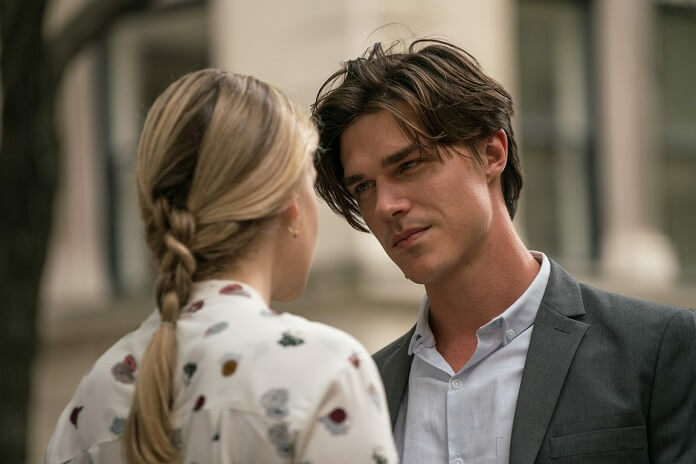 Finn Wittrock and Rachel Keller are able to soldier on over the rough spots and it’s their performances that engage the audience. Mortimer’s also fun to watch even while her storyline is the least fulfilling of the batch. Write When You Get Work has the bones of a good story but gets bogged down by playing too loosey goosey with logic while staging the theft of millions. The film would have been much more entertaining had it just concentrated on the relationship between Jonny and Ruth. Their romantic story deserved to be the centerpiece, but the attention was stolen by an unnecessarily convoluted mini crime spree.